Hi Lea! Can you please introduce yourself? What is the Oceanic Global? How was it founded? I founded the Oceanic Global Foundation in 2015 with the mission of engaging new audiences in ocean conservation. Since the inception of Oceanic Global, I have spearheaded a series of awareness-driven projects. In 2017, I led the execution of the organization's inaugural educational experience, Oceanic x Ibiza. Oceanic x Ibiza brought together over 4,000 guests along with thought leaders, institutions, artists, sustainable brands and more to celebrate our ocean and ignite action for conversation. In 2018, we launched The Oceanic Standard which is a guide offering sustainability solutions for the hospitality industry. What is your mission as a non-profit and how do you generate impact? The Oceanic Global Foundation engages new audiences in ocean conservation. We tap into universal passions to raise awareness for issues impacting our oceans and to provide individual and industry solutions that drive positive change. Oceanic engages local communities, creates immersive experiences, generates measurable impact, amplifies efforts of synergistic groups, and ignites global action. Can you give us a few examples of solutions that you have found and implemented in regards to ocean conservation and sustainable tourism? We believe that we can all become part of the solution and that it starts at an individual level but that it is also important to be working with businesses and industries to support responsible consumption. Oceanic Global first campaign was #ourchoicesmatter which provided individuals with sustainable tips that they could incorporate as part of their everyday life. One of the most easy steps we can all implement as consumers, is start to eliminate single-use plastics, whether that is saying to a plastic straw or not taking a plastic coffee cup lid. Another recent campaign #NoMoreButts we’ve launched in partnership with The TerraMar Project, aims to spread awareness for cigarette butts as plastic pollution and providing a recycling solution through TerraCycle. In April 2018, the Oceanic Global Foundation launched a program called The Oceanic Standard (TOS), to provide sustainable solutions for the hospitality industry. The Oceanic Standard provides hospitality stakeholders with easy, cost-effective alternatives to habitually used products and processes that threaten environmental and human health. TOS empowers both b2b and b2c change, supporting businesses and consumers alike in driving collective action and since launching, over 150 venues, leading organizations and institutions have implemented levels of the TOS and eliminated single-use plastics. Businesses that implement the TOS are awarded with one of three badges that recognizes their commitment level to sustainable practices. Can you explain the Oceanic Standard and how your sticker system works? Since launching the TOS, OG has developed different Editions of the TOS to meet different business needs: TOS Hospitality Edition, TOS Nightlife and Festival Edition, TOS Office Space Edition, TOS Best Boating Practices, TOS Coastal Tourism Edition (launching in November 2018). In addition to providing different Editions of TOS to provide easy solutions and empower businesses to implement best practices, OG has developed country-specific versions of TOS. Country specific Editions of the TOS suggest local vendors and resources, ensuring that change is happening on a localized level on a global scale. The US Edition was launched in April and the following will be launched in the Fall of 2018: Spanish Edition, Mexican Edition, Barbados Edition and a U.K Edition. The Oceanic Standard has developed three tiers of badges to recognize different levels of commitment. The tiers include: 1) "Straw-free Certified" awarded to venues that eliminate single-use plastic straws, 2) "Sustainability Steward" awarded to venues that implement three of TOS suggested sustainable practices, 3) "Ocean Champion” awarded to venues that implement six or more of TOS suggested sustainable practices. Please feel free to refer to TOS via www.oceanic.global/oceanic-standard/ for further information. We have partnered with groups that share the similar vision, like Sea Going Green to help implement and certify businesses globally. While implementing the TOS helps businesses on a local level through supporting actions like long-term tourism, OG’s database of businesses and their sustainable commitment, allows for OG to support policy reform around single-use plastics and create a movement around responsible consumption on a local and global scale. For example, through OG’s work with TOS, OG helped introduce the bill around New York banning plastic straws, by having New York venues make the switch to a sustainable alternative. Another example includes OG launching the Spanish Edition of TOS to help businesses in Ibiza achieve the islands pledge to go single-use plastic free by 2020. We have recently partnered in creating the coastal tourism guide! What are your hopes with this new standard? 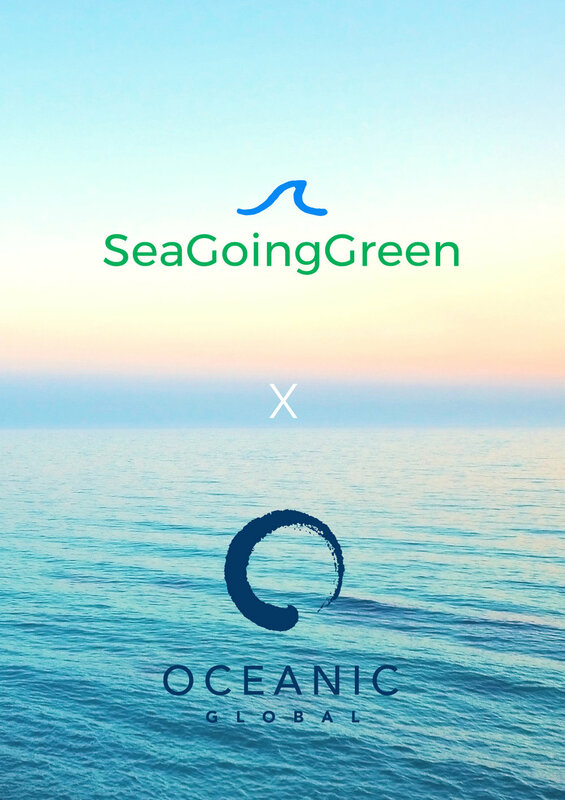 We are thrilled to be soon launching the Coastal Edition of The Oceanic Standard in partnership with Sea Going Green! Spearheaded by Oceanic Project Manager, Cassia Patel, The Oceanic Standard: Coastal Tourism Edition (TOS:CT) is an expanded edition of TOS providing a flexible, metric-based certification for all businesses in the tourism sector to prioritize human and ecological health. Covering seven core topics of sustainable operation, TOS:CT explores how the tourism industry, particularly in coastal regions, can adopt cost-efficient, healthy, green solutions. By providing the necessary tools, The Oceanic Standard: Coastal Tourism Edition empowers businesses to make decisions in the best interest of our environment and set a new standard around responsible consumption. Is it possible to get a sneak peak at any upcoming projects? Our Oceanic Hubs which we will be launching this Fall! Our hubs are led by dedicated volunteers that spearhead grassroots activations, host awareness and fundraising events, and drive localized impact on a global scale. As part of Oceanic Global’s City-by-City Immersive Experience Series, we are currently working towards Oceanic x NYC which will be taking place in the Summer of 2019!